A 7 day Uganda Wildlife safari, chimps and gorilla trek tour holiday to Bwindi Impenetrable National Park, Kibale National Park and Queen Elizabeth National Park. The tour is private and can start on any day from Entebbe or Kigali. You see lots of primates, monkeys, chimps, mountain gorillas, lots of birds, hippos, buffalo, crocodiles, and many more wild animals and birds. Day 7: Drive back to Entebbe (daily flights available as well) or Kigali Airport to finish safari. Chimpanzees are man’s closest cousins though they are one of the most threatened primate species. More primates like black and white colobus monkeys, L’Hoest monkeys, grey-cheeked mangabey, red-tailed monkeys, bush babies, pottos and many bird species like the yellow spotted nicator, rumped tinker bird, little greenbul, green breasted pitta, the crowned eagle, black bee-eater and mammals like elephants can be seen in this walk. Either a day’s walk in the foothills of the Rwenzoris, one of the great mountain ranges of the world, looking out for its forbidding peaks in the distance, or drive straight to Queen Elizabeth. The game seen will depend on the season; the Kasenyi plains are good for lion and the Mweya peninsula for a variety of animals. After breakfast, proceed for the morning briefing before enjoying the highlight of the trip - gorilla tracking in Bwindi Impenetrable National Forest, which may last the entire day. Gorilla trekking is unpredictable. It's difficult to foresee how many hours you will hike. The gorilla tracking excursion can take from 2 up to 8 hours. 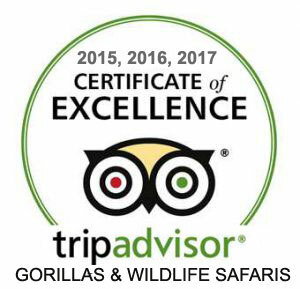 Expect to walk along distance in steep and muddy conditions, sometimes with rain overhead, before you encounter any gorillas. A good physical condition is recommended. For conservation purposes, time spent with the gorillas is limited to one hour. A ranger will brief you on how to behave with the gorillas. Day 7: Depart to Entebbe (or Kigali - 4 hours); optional daily flights available to Entebbe as well. Early breakfast before embarking on our return to Entebbe or Kigali, driving down the grassed and terraced escarpments of southwestern Uganda while taking in the breathtaking sights of the hills of the region dubbed ‘the little Switzerland of Africa’. We will be in Entebbe in the evening before for your flight back home. Our safari Landcruiser is for some, the ultimate safari vehicle in Africa. It's 4wd, spacious, high up and strong. It has a lift-up or pop-up roof for excellent safari game-viewing. The windows are wide opening for enhanced wildlife and scenery photography. For your comfort, all vehicles have air conditioning and charging facilities. Our safari land cruisers can take 3, 4, 6 and 8 persons.